JnS Sound & Lighting is one of the leading suppliers of PA and AV equipment in the Midlands. We specialise in customer relations and understanding exactly what a client needs. We get that all those wires may seem a little daunting to some, but be assured, we are here to help, not be the usual obnoxious techie that we’ve become so accustomed to. JnS has been trading since 2008 and has taken many steps forward in terms of stock, premises and expertise labour. We can provide a solution to your AV requirements based on the years of experience we have. We cater for events from private parties, to small festivals, with scaleable equipment to match. Whether you need 400W or 40,000W of speaker power, we can certainly help out. Our new website has come online in August 2018. We would love to hear your feedback and what you think to the new look. Please get in touch with us using the contact us page. JnS have recently invested in a Zero88 FLX lighting console along with a 23″ touchscreen monitor. 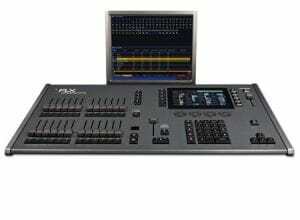 This console provides excellent versatility for both theatre and live production use. Its first outing will be with us at CEXFest 2018, should be a good one! Credit terms: All accounts are strictly pro-forma unless otherwise agreed. Full balances are due before the delivery date. Credit may be extended to business customers upon request and at our discretion. Great company - very helpful and willing to go the extra mile to assist. Sam particularly recommended! Such a brilliant service. Wonderful to deal with and the kit was all top quality. Would highly recommend! Great sound and very professional I would recommend any time! Great to work with highly recommended they are musicians who understand the needs if the client!